Think of this as a community service. Here is a trap that seems to work for me time and time again. Like all good traps the White moves look plausible (indeed even winning), until the realisation that what White intended to play (8.Qxh8) is no longer a good move, as the queen on d4 protects the rook. I suspect this is an example of an 'optical' trap, as the rook is undefended, until White sacrifices the knight. By then however it is too late. and while White has 3 pawns for the piece, he can't hang on to them (the e pawn is going), and will suffer through a lack of development. At the recent Oceania Zone meeting a list of development goals for emerging chess federations was tabled. I've included the list below. However while looking through the list it occurred to me that this doesn't have to be just for federations but could also be applicable down to the club level. For some clubs a number of the items have probably already been ticked off, but for smaller (but still serious) clubs, this is something that could function as a set of goals. Interestingly the club I play at (ANU Chess Club) already hits 6 of the 11 targets. (Note. I have trimmed the original list to remove what can only be achieved by a federation. In the end it was only 1 item). Such a thing does exist, and poems about chess have been written by a number of literary figures including Yeats, Pound and Tennyson. However they tend to focus more on the poetry than the chess, which can lead to poems that are both obscure and dry. To the game of the Pawn, and the Queen! And a fig for what others may do! And the intricate web of the French! And a comrade adept at the game! While most people visit www.fide.com to check out their new ratings, or to look up the FIDE handbook, there is the occasional interesting article hidden there as well. Nick Faulks, member of the FIDE Qualification Commision (and current Board 1 for Bermuda), makes a few observations concerning the current FIDE ratings system. Nick and I have discussed various ratings issues over the odd dinner or two, and while he and I don't agree on everything, I did like the following line from his article. Nor are ratings published for the excitement of the chess public, who may understandably like to view the top of the list as a form of horse race. You can read the whole thing here, and he is happy to recieve comments and suggestions on the topic. Here is a win by David Smerdon from this years ANU Open. Smerdon employed a tricky line against the Caro-Kan and although Adrian Chek avoided the obvious traps, he ended up in a passive position. Then a tactical oversight allowed Smerdon to gain a sizable advantage. I do have some sympathy for Adrian however, as he played this game immediately after holding Max Illingworth to a draw in a game that probably went for 100 moves. The 2009 ANU Minor had an exciting finish, with a dramatic last round leaving 3 players tide for first place. 10 year old Ethan Derwent had led the tournament from the start and went into the final round with a full point lead. His last round opponent was Joe Marks, who needed a win to catch up, and in the final game of the tournament to finish, managed to survie a time scramble and pocket the point. A win by Josh Bishop on Board 2 completed the trio of players on 6/7. A full crosstable for this event is in the comments section to this post. IM (soon to be GM) David Smerdon has won the ANU Open for the second year in a row, with an undefeated 6/7. He took outright first with a final round win over tournament surprise packet Zachary Searle, while his closest challenger, Junra Ikeda, was held to a draw by Max Illingworth. Smerdon conceded draws to second seed IM Andras Toth, and Ikeda, while Ikeda drew with Toth as well. Ikeda's 4 wins and 3 draws was enough to secure outright second. Tied for third place were Max Illingworth, Zachary Searle, Endre Ambrus (a final round winner over IM Toth) and Yi Yuan. Searle only lost to the winner Smerdon in the final round, and second place getter Ikeda, in the first round! A quartet of ACT Juniors hold down the top positions in the 2009 ANU Minor (Under 1600) event. Yijun Zhang and Ethean Derwent finished the day with 4 wins from 4 games, while Matthew Bennet and Joshua Bishop scored 3 wins (plus a draw with each other) to be equal third on 3.5. But to show it isn't all about juniors, of the 8 players tied on 3 points, only 2 are juniors (and one of these is just shy of her 18th birthday). A full crosstable is in the comments section to this post. While not matching the stupendous turnout from last year, a field of 81 players was still a good turnout for the 17th ANU Open. The Open section attracted 36 players, with the top 5 seeds rated 2199 and above, and interestingly, all from Canberra. The first 2 rounds went according to script, although there were a couple of upsets lower down. Round 3 saw the clash of the top seeds, with Junta Ikeda and David Smerdon drawing on the top board, and Max Illingworth defeating Endre Ambrus on Board 3. This allowed Andras Toth, Max Illingworth and Sam Grigg to lead with 3/3. In the 4th round Grigg forced a perpetual against Toth, and Smerdon beat Illingworth. Ikeda then joined the leaders after Ambrus' mobile phone went off. So at the halfway point Smerdon, Toth, Ikeda and Grigg share the lead on 3.5/4. A full crosstable is in the comments section to this post. Despite waking up to -3 degrees this morning, Canberra turned on a perfect winters day for the ANU Co-Op Bookshop Simul. And IM Andras Toth turned out a perfect performance scoring 17 wins, no draws and no losses against the assembled opposition. The players were a mixture of Canberra club players (rated between 1200 and 1750) and adventurous passers by (including one visitor from Kazakhstan). Under instructions to finish the simul under 1 hour and 45 minutes, IM Toth obliged, finishing the final game with 30 seconds to spare. He was helped by the opening choice of some of his opponents with no less than 4 French Defences (as far as I could see). Now if I was giving a simul, the French Defence would be the one opening I would love to see, as pawn on e5, Bishop on d3, and a queen heading for g4 or h5 is not only an easy plan to follow, but usually results in a quick knockout. Oddly enough one of the games that looked like it would be over pretty quickly turned out to be the last game to finish. 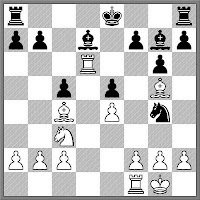 Milan Ninchich missed a tactical shot on move 14 and lost 2 pawns. However he dug in and missed a chance to draw right at the end with 48. ... Kd3 (instead of the losing 48. ... Be1). The 2009 ANU Chess Festival kicks off tomorrow (24 July) with the traditional University Co-Op Bookshop Simul. IM Andras Toth will play 20 players in the centre of Canberra (outdoors no less), with the winners not only gaining a little bit of chess glory, but also winning a $25 book voucher provided by the sponsor. The simul is in Citt Walk (outside King O'Malley's pub) and begins at 12 noon. There is no charge to take part. Saturday and Sunday (25th and 26th July) sees the 17th ANU Open, at Fenner Hall, Northbourne Ave, Dickson. Always a popular (and dare I say, important) weekender, has been won by some of the great names of Australian chess. GM David Smerdon is defending the title he won last year, and a field of over 80 players is expected for the Open and Minor tournaments. Then a few weeks later the ANU Schools Championship takes place. Originally the only schools teams event in Canberra, it is now more a end of chess season get together for the regions schools, with the serious stuff now being organised by the ACT Junior Chess League. Depending on net access from the venue I will try and bring results and games from the weekender as frequently as possible. I will also try and use my twitter feed to bring more immediate news. One of the problems that you can run into when playing an opponent who doesn't know when to resign, is that it can take the shine of an otherwise good game. The more extreme version of this behaviour is when a player chooses to drag the game out, or simply finishes the game with an awful blunder (eg hanging the queen), in an effort to stop it from being published. I have heard stories of this happening in the past, either due to personal animosity between the players concerned, or simply annoyance at losing an important game. Here is a game I played at my local club, which sort of falls into this category. I won't give the name of my opponent, as it wasn't a case of malicious forethought, but I did suggest to him after the game that he needs to be a little more serious about his chess etiquette. Space seems to be a hot topic at the moment, with the 40th anniversary of the first men on the Moon, as well as a big solar eclipse about the happen. But another space related story involves an amateur astronomer from Murrumbateman (just outside Canberra). Anthony Wesley, using a 14.5 inch telescope in his backyard, managed to capture images of a comet (or possibly an asteroid) crashing into Jupiter. The impact was later confirm by NASA, and is only the second observed collision between Jupiter and another object. Anthony also happens to be a past member of the Belconnen Chess Club in Canberra, and was a regular participant in the National Computer Chess Championships. I suspect these days his interest in astronomy precludes an active chess career but nonetheless our paths do cross from time to time. Here is the full report from The Age, and a hat tip to The RiotACT for alerting me to this story. I finally made the time to watch "The Luzhin Defence" last week, and I must say it was well worth it. Visually it is a magnificent movie (with a lot of the scenery reminding me of Bled, although it was shot around Lake Como) and the performances of all the actors were very good. Even the chess scenes were pretty well done (GM Jon Speelman was a consultant for the movie) although like most movies about chess, there were some shortcuts taken for dramatic effect. One of the most interesting scenes involved a brilliant combination involving a rook and queen sac. It looked familiar while watching it, and I recalled it somehow involving Max Euwe. It turns out that Euwe was on the losing end of the combination, with the winner being Milan Vidmar Sr. It also turns out the position used in the movie was (a) not exactly the same as in the game and (b) this resulted in the actual combination being illegal. Here is the game, with the diagram at the crucial point. The problem for the movie was that the Black rook on c2 was placed on c1, thereby pinning the rook on the d file, meaning the final move couldn't legally be played! There are certain openings that work better at Blitz than they do at longer time controls. Normally these are trappy lines involving material investment, although sometimes they are so dodgy that the opponent chews up time looking for the immediate refutation. 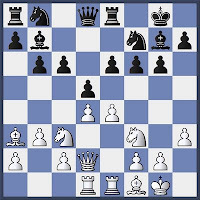 With the increased popularity of online "bullet' chess (1 0), you now see the Halloween Gambit (1.e4 e5 2.Nf3 Nc6 3.Nc3 Nf6 4.Nxe5) or the Hiroshima Variation of the Sicilian (1.e4 c5 2.Qh5) becoming more well known. But there are also the 'classics' that you may need to know. I watched the post-mortem of a game yesterday involving a very early sac on f2. While I didn't see the game myself, I did see various positions that may have arisen. In the end the conclusion from both players was that it was winning for Black, but mainly due to the fast time control. While I don't have the game played yesterday, I have another game in the same line, but with the following kicker. Rather than being a forced win, it turns out that it may well be a forced draw, and a draw that has been around for over 100 years. The Miniature of the Month for June 2009 could almost be titled 'Caught in the Crosshairs'. 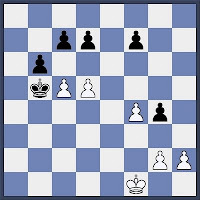 After Blacks 13th move the White Queen has nowhere to run, and White has to surrender the exchange to protect the lady. "Six Thinking Hats" by Edward De Bono is considered as one of the most innovative books on thinking and the decision making process. I've often wondered whether the various 'hats', and the thinking process, could be applied to chess. I'm not sure it is the most efficient way to choose a move during the game, but here is my attempt at matching hats to chess concepts. For those unfamiliar with 'Six Thinking Hats', each hat stands for a different part of the thought process. And while making a decision (or coming to a conclusion), each hat is worn as a way of applying the different thinking techniques. Here is a list of hats (by colour), and the related chess concepts. Blue Hat - Controlling the thinking process. In chess this firstly concerns how much thinking you need to do. You may only have one reply (eg a recapture) or you may be short of time. At the end of the thinking process you also use this to decide on your move (or to decide you've done enough thinking). White Hat - Facts and Figures. In chess this would be material balance, plus position factors (open files, outposts, doubles pawns etc). Knowing what problem you are solving often puts you half way to the answer. Black Hat - Caution and Care. In chess this would be looking for immediate threats from your opponent, and at a higher level, prophylactic thinking. 'What is my opponent threatening to do?' would be a good question to ask while wearing this hat. Green Hat - Creative thinking. Probably best used when obvious moves don't seem to help. The 'Where do I want my pieces to be?' question falls under this category. Yellow Hat - Constructive thinking. Ultimately you need to analyse your alternatives, and here is where you do it. This is the 'I move, then they move, then I move' part of the process. Now while this may seem to be an impractical way of choosing a move (as I feel that chess thinking involves a lot of overlapping concepts) there is some good news. This approach to choosing your move has already been described, in a sense, and certainly predates the publication of De Bono's book. I am referring to CJS Purdy's 'System for choosing a move' which he laid out in the pages of "Chess World", and which he himself used to win the first World Correspondence Championship. So it is possible to bring a formal thinking process into your game, but whether it is practical is a question I have yet to answer. I recently read a suggestion (possibly from Hans Ree), that if a combination doesn't seem to work, try changing the move order. Playing a less obvious move may bring greater rewards than charging headlong into the gates. I recently gave a game from the 1953 Zurich Candidates tournament where Paul Keres came unstuck after trying a novelty in the opening. To balance the ledger I have a game from the same event, where Keres benefited from an unsuccessful innovation from Isaac Boleslavsky. It also illustrates the point of this article, in that Boleslavsky only looked at Keres' possible replies in one order, and didn't consider the alternative. Via the wonderful XKCD I visited TVTropes, which is a catalogue of tricks used in writing fiction. As with most sites of this nature, a simple test of usefulness is to type 'chess' into the search function on the page. I've finally managed to get the final results from the South African Open (the website, while technically clever, doesn't provide much information). IM Amon Simutowe (Zambia) was the outright winner with 9.5/11. In second place was GM Gawain Jones (England, but playing from Melbourne, Australia) on 9.0/11. IM Puchen Wang (New Zealand) finished in a tie for third on 8.5, and he was also playing from Melbourne. The other 'remote' player, IM Mirko Rujevic (Australia) finished on 7.5, but he did it particularly tough, working during the day and then playing his games in the middle of the night (due to the difference in time zones between Melbourne and South Africa). Last Saturday I was playing some 'coffee house' chess while keeping an eye on Street Chess. Now while 'coffee house' normally means an attacking but probably unsound style of chess, to me it also indicates a certain degree of co-operation between the players. In the first game I played winning chances bounced back and forth between myself and my opponent, until I eventually 'arranged' a draw. I was less kind in the second and third games, although I did let my king get chased all around the board in game 2. Now I don't have any of those games to show, but I do have an amazing game from 1844. Interestingly it involved Lionel Kieseritzky, who lost the 'Immortal Game' to Adolf Anderssen a few year later. He was also the loser in this game, but I suspect (without a shred of evidence!) that the result wasn't as important as the creation. It is the 'unnatural' nature of problem positions that seem to scare off chess players from attempting them. Although the 'this looks stupid' is not so much a barrier to solving them (as the laws of chess remain the same whether it is a game of chess or a composed position), but simple a barrier to considering them in the first place. However once I learned to get past the problem of the placing of pieces (realising that each piece contributes to not only the question, but also the answer) chess problems became much more accessible. Here are two different problems from the same composer, William Shinkman. The first looks more 'natural than the second, but enjoy the challenge of trying to solve both. Both are White to play and mate in 3. Normally I'd be scrambling around the net (or my house) for something to post for today. But I've been totally distracted by the hammering Australia is currently giving England in the cricket. 4 centuries for Australia (and 5 for the English bowlers!) indicate that normal service has been resumed. One of the great nicknames in Australian chess is attached to David Flude. This very active CC player and theorist, and over the board player as well, was christened "The Flavoured Dude" sometime in the past. Whether this reflects his playing style in the way that "Monosol" seems to describe Stephen Solomon's style, I cannot say. Nonetheless there is an attacking flavour to David's game, as the following win in the Australia v Finland Friendly demonstrates. In terms of influential chess books, "My System" nearly always gets a mention. After that I've seen various other books mentioned, but one book that both seems to get listed a fair bit, and yet I am always surprised to see it mentioned, is "Chess Fundamantals" by J.R. Capablanca. I have a couple of copies (including a 1921 copy purchased for $10) but I seem to be missing it's significance. To me it seems to be a book that "shows" things, rather than "explains" things, and jumps between being a beginner's tome to a collection of games and positions. Of course Capablanca may not have intended to to be an instructional manual in the traditional sense, although the is how it seems to be treated. Of course I could just be missing the point, which is entirely plausible given how long it took me to discover Nimzowitsch. With the Ashes series starting today (for the truly ignorant, a 5 match series between Australia and England in Cricket), I had a look back at how Australia fared against England at the Chess Olympiads. 'Not very well' turned out to be the answer. Unlike the cricket, where Australia has dominated over the last 20 years (2005 notwithstanding), it has been the complete opposite in chess. Over at the 'Susan Polgar Chess Daily News' blog there is a story about a player who left the board, and when he returned found it had been packed away. To his displeasure he also found that the game had been awarded to his opponent. If you wish to read the whole story (and as a bonus get an insight into current US chess politics) click here. I've actually seen this happen in a previous Doeberl Cup, in a game involving Lloyd Fell (IIRC). In this case it was during the last round, when the organisers were beginning to pack equipment away. The usual practice was to wait until a game had finished and then pack up. In the game in question it seems both players were away from the board (both I suspect having moved and gone for a toilet break), and an overly zealous helper swooped on the abandoned chess set. In this case neither player was defaulted, and the position and times were reset according to the players score sheets and memories, and the game reached a more sensible conclusion. 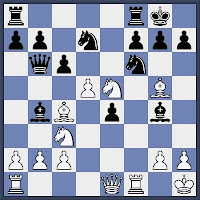 In most chess openings it is normally the rooks that are the last to move (castling excepted). Sometimes the kingside rook gets into action early, but the queens rook is usually the last guy to join the party. There are plenty of sensible reasons why this is so, but here is a warning if you try and buck the trend. In the 1953 Candidates tournament, Paul Keres plays Rb8 as early as move 5, in an attempt to counter David Bronstein's Closed Sicilian. However this rebounds pretty quickly as the rook proves to be misplaced, and Bronstein gathers the point (although it takes it 58 moves). In future years the 2009 South African Open might be spoken of in the same sentence as the 1965 Capablanca Memorial. In that event, Bobby Fischer played the event via telegraph, after being refused permission to travel to Cuba. Despite the handicap of the lengthened playing session, and not being able to see his opponents, he still finished second. While South Africa in 2009 doesn't present the same difficulties for players wishing the travel there, there are 3 players taking part in the 2009 South African Open, who are half a world away. GM Gawain Jones (Eng), IM Mirko Rujevic (Aus) and IM Puchen Wang (Nzl) are playing in this event from Melbourne, Australia. Of course technology has progressed from the telegraph age (with the internet being used to transmit the moves), but I suppose the some difficulties arise. Instead of tranmission time, it is now session times, with some rounds starting at 2:30am Melbourne time. Not only does this make it difficult for the players, it also requires the supervising arbiter IA Gary Bekker to forgoe his sleep. However they all have seemed to cope so far with the 3 of them starting the event with 4/4. Live games can be found at http://www.chesscube.com while the tournament results can be found at the link at the top of this post. Todays edition of Street Chess saw 75% of the current PNG Olympiad team in action. FM Rupert Jones has spent an extra week in Canberra after the completion of the Zonal on the Gold Coast, and joined myself and Craig Skehan in the 19 player field. We were a little fortunate that players like David Smerdon and Endre Ambrus were otherwise engaged, but still we managed to do PNG chess proud. Enjoying the rare opportunity to play Street Chess from round 1 (I'm normally chess coaching until midday on Saturdays), I started with 6 wins before drawing my final game. Rupert Jones had a slower start but managed to take equal second place on 5/7 with a final round draw. Now if you connect the dots (my last round draw, Rupert's last round draw) you will have guessed it was against each other. It ended in a quick perpetual, but don't try and use this in any of your own games as a way of circumventing any 'no agreed draws in under 175 moves' stipulations as after Black played 7. ... g6 (instead of 7. 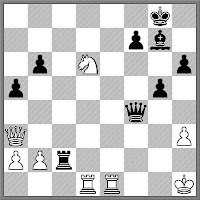 ... d5) White is just winning. The updated FIDE Laws of Chess that were agreed upon at the Dresden Olympiad came into force on the 1st July 2009. On Chessvibes the Chairman of the Rules and Tournament Regulation Committee Geurt Gijssen discusses what the changes mean. Unfortunately, at the time of this post, FIDE haven't updated their own website, so the rules from 1 July 2005 are the ones still shown. If you are interested in my take on the process involved changing the rules, you can read my report of the RTRC meeting here. Reading the chessvibes article I was nonetheless surprised with the claim that the rules for Chess960 were included in the appendices. I have no way of confirming this (given the FIDE website showing the old rules) but I am certain that the RTRC did not add the rules for Chess960 to the FIDE Laws of Chess, and indeed explicitly decided to hold it over for a future discussion. So I have no idea how the rules have made it into the final version (if indeed they are there at all). The final thing to note, that as the new rules have come into effect, the whole process of deciding on the rules in 2012 has now started. So if you think that there are some silly rules that need changing (and I can think of a few), you can begin to make you suggestions to the FIDE RTRC. After blundering in my last K+P ending (as shown here), I decided to have a look at some other K+P positions, if only to reacquaint myself with some of the standard endgame ideas (or tricks!). I came across the given position, which is a study by Troitzky. 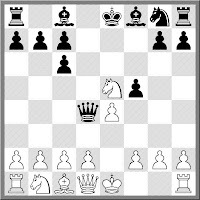 It is white to play and win, and without giving too much away, it shows that a lone king can hold back 3 connected (but unassisted) passed pawns. I have a policy when meeting junior players for the first time. I try to beat them as heavily as possible. Not because I am a cruel person, but because I know that they will one day become much stronger players and I want to retain some sort of advantage over them when they do. (A testament to this policy is that I have a 5-0 score against an Australian WIM, although to be fair, we haven't played since she was a teenager). And if you can string together a couple of wins, every time you sit down against a promising young talent, the losing streak surely plays on their mind.